We offer fast, friendly, professional, personalised service at reasonable rates (read our reviews here). 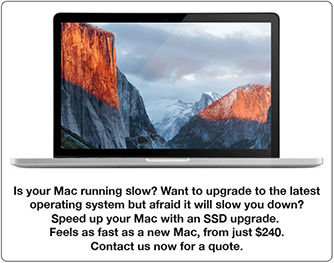 We have over 25 years experience in Sydney as Apple Mac training, repair and tech support specialists. We are available 24/7 for after-hours emergencies. Onsite (in-person) or remote support (via phone, email, Skype or remote access). Your local Mac technician for Sydney, the Lower North Shore, Artarmon, Balmain, Birchgrove, Chatswood, Crows Nest, Drummoyne, East Ryde, Gladesville, Greenwich, Henley, Hunters Hill, Kirribilli, Lane Cove, Lane Cove North, Lane Cove West, Lavender Bay, Linley Point, Longueville, McMahons Point, Naremburn, North Sydney, Northbridge, Northwood, Riverview, Rozelle, St Leonards, Willoughby, Wollstonecraft and Woolwich.